I FINALLY found a way to incorporate the phrase I said I would bring back! In all seriousness, it is most applicable to this most recent event that I ended up shooting this past weekend. It was a book launch party for my Frat brother (for those of you that are schooled on the process, I was actually his Dean) Chris King. It had been quite a while since I've done an event and this one was well worth revisiting that type of booking. I told myself a while ago that I would only do certain events (not counting weddings). There was once a time I would jump at any opportunity to shoot them. I would even actively pursue them. I assumed they would always be good networking opportunities. I could shoot the event, hand out cards and meet new people who would then hit me up for their future photography needs. Didn't quite pan out that way. I think I could probably count on one hand how many gigs I ended up getting as a result of contacts made at shooting events. When certain folks ask me to shoot events, the answer would always be yes. Family and Frat being at the top of the list. There may come a time where I won't be able to be so picky so for now I consider myself blessed that that's not the case. It works out very nice when I'm able to shoot events that are benefiting those folks close to me while it can also add to my portfolio in some fashion. 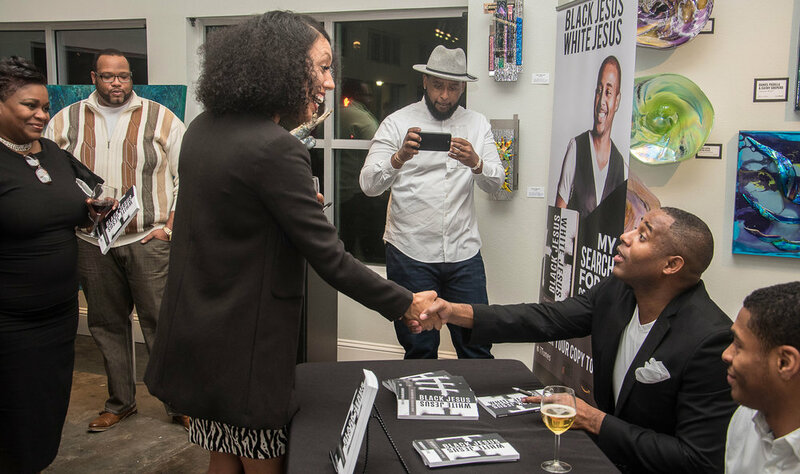 I felt a little bad because I didn't have a chance to read Chris's book "Black Jesus White Jesus: My Search for a Colorless Christ" prior to shooting the official launch party. The name alone reminded me of one of my favorite books "Black Lies, White Lies" by Tony Brown (ironically, also Frat). That coupled along with the fact that I personally know the cat writing it has me really looking forward to reading it. As far as my involvement, I almost ran into a major glitch. Thought I had my batteries all charged and ready to go. Get to the venue and found out that I was down to 1 1/2 charged batteries with both my charger AND my back-up charger at home. Fortunately, I was able to get the most out of that charge to last the entire two hours without missing any money shots. The event could not have went better. It was set in a venue of an intimate Frisco Art Gallery. It was the perfect backdrop for photos rather than looking at blandly painted walls. It provided extra conversation pieces for folks as they mingled. That didn't seem to matter though because every guest there was more personable than the next. I don't know if everyone knew everyone there prior to coming, but everyone got along and fellowshipped as if they had known one another for ages. It made for a very comfortable setting for all involved. If all events were as smooth as this one, I'd definitely try to shoot more of them.